What could be better than driving a tank? Crushing a car with a tank, that’s what! 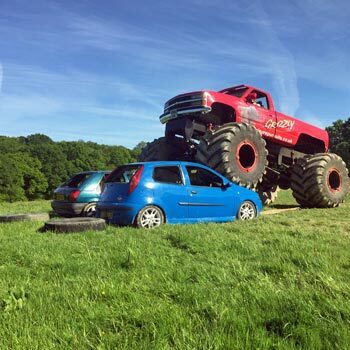 There are tank driving experiences and there are tank paintballing experiences, and here at tankdrivingexperience we’ve picked an even more intense experience – it’s CAR CRUSHING! If you’re the kind who wants to go that little bit further, then you’ll love this fabulous tank driving car crushing experience. Yes, you get to drive a tank over a car. Again. And again. And on all these crush-a-car experiences, you actually get do drive the tank yourself as it goes over the poor doomed motor car. On some experiences that feature car-crushing, you may find that you’re in the tank with three or four other people and the crush driver is selected from among you by the instructor. So you get single-handed car-crushing, but you’re guaranteed to be the crusher, which is why these experiences cost a bit more than the other type. If you must, absolutely must, drive a tank over a car in person, rather than ride in a tank that’s being driven over a car, then these experiences are the only ones that will do the job for you. Your tank-crushing day has you careering over the roughest terrain in the legendary Ferret (ever done 50mph in reverse?) and the old warhorse FV432 armoured personnel carrier – all 15 tons of it. Hang on to your hat as you put your soldiering skills to the test in these military monsters. And when you’ve mastered your tank driving skills, bring on the car. But not for long as you see how quickly you can reduce the car to a pile of mangled metal. Feel the adrenalin, thrill to the roar of the massive engine. The power of this fabled tank is unimaginable and you get to put it all to use. Tank versus car – no contest. Make sure you’ve got plenty of pictures and videos of you crushing the car and careering backwards at up to 50mph. Spectators are made more than welcome and get refreshments and a free ride themselves. But their main job will be to make that definitive record of your day to post on Youtube. In fact if you send it to us, we’ll even post in on here for you too. This is a tank driving experience that will live long in your memory, make your mates green with envy and make you long to do it again. And as that special gift for someone who has everything, or someone that’s impossible to buy for, this car crush with a tank will be sure to light up his eyes. And just think how grateful he’ll be! Full Monty tank driving experience – are you hard enough? Ever fancied yourself driving a tank? Or an Armoured Personnel Carrier, an amphibious Hagglund or a Missile Carrier? Well this is your chance to drive them ALL and play soldiers for this full day tank driving experience. And you only need to be 13 years old to join in. When it comes to tanks and armoured vehicles, the army’s got the lot. Well now’s your chance to join in the fun, driving round all day in military vehicles and tanks, shooting stuff, crushing stuff and having the time of your life. On this great Full Monty tank driving experience, you’ll start by getting dressed for the part in your personal camouflage suit and helmet. And your tank driving camouflage suit is your to take away (just the thing for the office party!). Then a quick safety briefing, and it’s straight into action for the tank driving experience of a lifetime. You’ll drive them all on this fabulous full monty tank driving experience. Feel on top of the world in a legendary Russian Gvozdika tank weighing in at a mighty 16 tons and measuring 25 long and a towering nine feet high. You’ve seen it on the news, now drive this amazing tank yourself and thrill to the power as the mighty beast throbs beneath you. And there’s the renowned FV432 Armoured Personnel Carrier (or APC as you’ll come away calling this great machine) and an amphibious Hagglund tracked carrier. And let’s not forget the powerful Rapier rocket carrier and Lance missile carrier. How much excitement can a man take in a day? 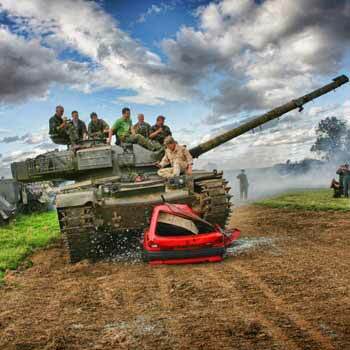 this great tank driving experience certainly puts it to the test. And as well as the driving, there’s firing muskets and mortars, shooting clays and woodland patrolling SAS style. Yes, it’s 56 tons of raw steel, and the day’s best driver will take the controls and use the Chieftain’s amazing power to crush a car while the others stand in the cockpit cheering and shouting. How about that for a Youtube picture? The Full Monty tank driving experience is a tank driving experience and more. Treat yourself, or even better bookmark this page and get your other half to give you the best Christmas present you’ve ever had bar none. The full Monty tank driving experience is run at Brackley in Northants on ideal tank terrain – the rougher the better. You can treat yourself (or your other half) to the Full Monty experience through the country’s top experience day specialists. It’s the same experience from all of them but we keep prices updated in real time and as you can see, you can save a few quid depending on who you buy it from. You are currently browsing the archives for the Crush a car category.